Manhattan is full of organizations dedicated to improving the community around them. 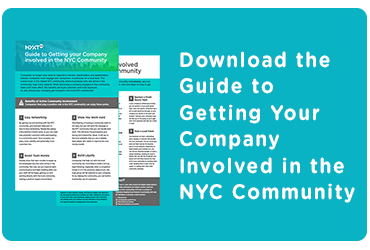 By volunteering in Manhattan with one of these organizations, you can learn more about the inspiring individuals behind the efforts and see firsthand what it means to come together as a community. If you’re wondering which organizations offer community volunteering opportunities, read on below. El Taller Latino (The Latin American Workshop) is a non-profit organization dedicated to bridging the gap between Latin Americans and North Americans through art, dance, and music. The organization offers a wealth of classes, from language to dance to music, for people in the community. El Taller Latino is looking for volunteers to help with events (set up, clean up, working the door, etc. ), web design and development, office assistance, writing, marketing, and social media, so contact them if you want to learn more. Transportation Alternatives is a growing community group with 100,000 active supporters who advocate for new bike lanes, public plazas, and new traffic laws in order to improve the New York City streets. This group is always looking for volunteers to sign petitions, join citywide campaigns, or get involved with local neighborhood campaigns. If you are a biker, then this organization needs you. StreetFilms produces short films that show how communities can have better places to live, work, and play through smart transportation design and policy. These films educate the viewers on sustainable transportation, hoping to inspire change worldwide. To get involved with this organization, check out their Take Action page or contact them directly. The Lesbian, Gay, Bisexual, and Transgender Community Center celebrates individuals for who they are in an open, welcoming space. The Center offers a host of services, including health and wellness programs, arts programs, entertainment and cultural events, parenthood and family support services, and more. There are many ways to get involved with the LGBT Center, so check out their volunteer page for more. Big Brothers Big Sisters (BBBS) of New York City seeks to give all children of NYC an opportunity to receive professionally-supported, one-to-one mentorship with individuals that will change their lives for the better. BBBS of NYC is a renowned organization that works with the community, volunteers, and local organizations to bring about positive change. View their volunteer page to find out more about how to get involved. All of these organizations are looking for dedicated individuals that understand the importance of community engagement. Even if you only have a small amount of free time, consider volunteering to make a difference.